AcuRite 01036 Pro Color weather station enables you to plan your day confidently. Now you can get a customized weather station in your backyard that will provide you weather forecast and real-time weather conditions. This is possible because of the self-calibrating technology that is incorporated in the device that enables it to provide anaccurate weather forecast. It has an array of integrated sensor and a color console that displays the generated data. The design of AcuRite 01036 Pro Color is ideal for home or personal use. The sensor unit can be placed outdoor while the console can be placed indoors such as on a wall or on a table. This device offers a wireless weather station and this means that the sensor unit can send data wirelessly to the console. The console can be connected to aPersonal computer using a USB cable. The sensor unit can transmit data to console up to a radius of 100m or 330ft. for efficient data transmission, the distance between the console and the sensor unit should not exceed this radius. However, transmission can be affected by barriers such as walls. The sensor unit is powered by 4 AA alkaline or Lithium batteries and they can last for approximately 2 years. In places where the temperature drops to below -29oC lithium batteries are recommended. In addition, this unit has 2 solar panels. These panels power aninternal fan that is responsible for maintaining normal temperature to enhance the accuracy of the thermometer. The console is powered by 4.5v power adapter and a backup of 6 AA alkaline batteries. The sensor unit is made of five components that measure different weather aspects. The components are a rain collector that has a self-emptying mechanism, wind vane, thermometer and a hygrometer. The console is illuminated and it also has indoor sensors. The complete weather station provides anaccurate forecast for 12-24 hours using the self-calibrating forecasting mechanism. It has a weather ticker which streams real-time data and alerts. The thermometer and hygrometer can show indoor and outdoor temperature and relative humidity. The temperature and humidity data are updated every 36 seconds with anaccuracy of +/-2oF and +/-2% to+/-5% respectively. The thermometer can measure atemperature range of 0oC to 50oC for the indoor sensor while the outdoor sensor can measure atemperature range of -40oC to 70oC. For the hygrometer, the indoor sensor has arange of 16% to 98% while the outdoor sensor has arange of 1% to 99% relative humidity. The rain collector measures rain precipitation and provides rainfall data with anaccuracy of 0.05”per Inch. This sensor can measure as little precipitation a 0.01 inches. The anemometer and the wind vane provides wind speed and direction respectively. The wind speed data is updated every 18 seconds while the direction is updated every 30 seconds. The accuracy of the anemometer is +/-2 mph to +/-5 mph though it is dependent on the increasing wind speed. This anemometer has a range of 0 to 99mph of wind speed. When it comes to cost, AcuRite 01036 Pro Color is reasonably priced. This weather station is ideal for anaverage budget person. You will be given a 1-year limited warranty upon purchasing this weather station. If the device fails to meet your expectations, then you can return it within 90 days from the date of purchase. This device is a wireless unit that makes it easier to install without professional assistance. It comes with the mounting hardware. Therefore the installation is made even easier. It is an affordable device that can be used to get real-time weather data and forecast right from the backyard. It can be connected to a personal computer and share the data generated and also analyze it. The device is also durable and has a rugged design. This makes it be used for long without failure or need for repair. The wireless feature can sometimes experience signal drops or they can be affected by barriers such a walls. The internal fan that ensures the sensor gives accurate temperature data may wear out over time that means that accuracy in temperature data will gradually decrease. 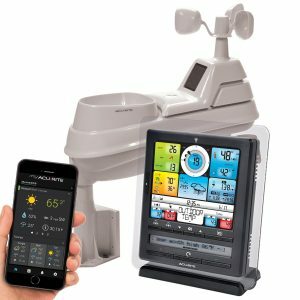 AcuRite 01036 Pro Color is an ideal home or personal weather station for anyone who wants to get a reliable and affordable unit that will provide data about the various weather aspects and has the capability of forecasting. Cheap Weather Station Copyright © 2019.